The extremely versatile Caviar Stick Eye Colour delivers effortless application, intense, buildable color and up to 12-hour wear. Pigment-rich shades in creamy shimmer and matte finishes glide seamlessly onto the lids, staying crease and transfer-resistant. The luxe formulation gives you plenty of time to smudge, blend, line, fill or define, so you can effortlessly create any look. Don’t be afraid to be playful! Caviar Stick Eye Colour layers easily over or under other eyeshadows, including powder. Apply directly to the lash line for a smoky liner effect, or all over the eye lid for higher impact. 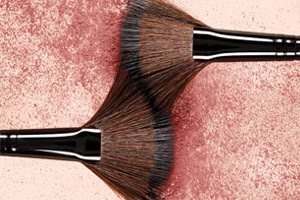 Blend with a brush or the fingertips. (Smoke): Cyclopentasiloxane, Trimethylsiloxysilicate, Mica (CI 77019), Polyethylene, Lauroyl Lysine, Ozokerite, Octyldodecanol, Synthetic Beeswax, Silica, Lecithin, Tocopherol, Ascorbyl Palmitate, Citric Acid. May Contain (+/-): CI 77491, CI 77492, CI 77499 (Iron Oxide), CI 77007 (Ultramarines), CI 77000 (Aluminum Powder), CI 77891 (Titanium Dioxide). (Sapphire): Cyclopentasiloxane, Trimethylsiloxysilicate, Mica (CI 77019), Polyethylene, Lauroyl Lysine, Ozokerite, Octyldodecanol, Synthetic Beeswax, Tin Oxide, Lecithin, Tocopherol, Ascorbyl Palmitate, Citric Acid. May Contain (+/-): CI 77891 (Titanium Dioxide), CI 77499 (Iron Oxide), CI 77510 (Ferric Ammonium Ferrocyanide). (Amethyst): Cyclopentasiloxane, Mica (CI 77019), Trimethylsiloxysilicate, Polyethylene, Lauroyl Lysine, Ozokerite, Octyldodecanol, Synthetic Beeswax, Lecithin, Tin Oxide, Tocopherol, Ascorbyl Palmitate, Citric Acid. May Contain (+/-): CI 77491, CI 77492, CI 77499 (Iron Oxides), CI 77891 (Titanium Dioxide). (Plum): Cyclopentasiloxane, Trimethylsiloxysilicate, Mica (CI 77109), Polyethylene, Lauroyl Lysine, Ozokerite, Octyldodecanol, Synthetic Beeswax, Lecithin, Tocopherol, Ascorbyl Palmitate, Tin Oxide, Citric Acid. May Contain (+/-): CI 77491, CI 77492, CI 77499 (Iron Oxides), CI 77891 (Titanium Dioxide), CI 75470 (Carmine), CI 77007 (Ultramarines), CI 77510 (Ferric Ammonium Ferrocyanide). (Cocoa): Cyclopentasiloxane, Trimethylsiloxysilicate, Mica (CI 77019), Polyethylene, Lauroyl Lysine, Ozokerite, Octyldodecanol, Synthetic Beeswax, Lecithin, Tocopherol, Ascorbyl Palmitate, Citric Acid. May Contain (+/-): CI 77491, CI 77492, CI 77499 (Iron Oxides), CI 77891 (Titanium Dioxide). (Khaki): Cyclopentasiloxane, Trimethylsiloxysilicate, Mica (CI 77109), Polyethylene, Lauroyl Lysine, Ozokerite, Octyldodecanol, Synthetic Beeswax, Lecithin, Tin Oxide, Tocopherol, Ascorbyl Palmitate, Citric Acid. May Contain (+/-): CI 77491, CI 77492, CI 77499 (Iron Oxides), CI 77891 (Titanium Dioxide). (Jungle): Cyclopentasiloxane, Trimethylsiloxysilicate, Mica (CI 77019), Polyethylene, Lauroyl Lysine, Ozokerite, Octyldodecanol, Synthetic Beeswax, Lecithin, Tin Oxide, Tocopherol, Ascorbyl Palmitate, Citric Acid. May Contain (+/-): CI 77491, CI 77492, CI 77499 (Iron Oxides), CI 77891 (Titanium Dioxide), CI 77510 (Ferric Ammonium Ferrocyanide), CI 77510 (Ferric Ferrocyanide). (Steel): Cyclopentasiloxane, Mica (CI 77019), Trimethylsiloxysilicate, Polyethylene, Lauroyl Lysine, Ozokerite, Octyldodecanol, Synthetic Beeswax, Tin Oxide, Lecithin, Tocopherol, Ascorbyl Palmitate, Citric Acid. May Contain (+/-): CI 77891 (Titanium Dioxide), CI 77163 (Bismuth Oxychloride), CI 77491, CI 77492, CI 77499 (Iron Oxides), CI 75470 (Carmine), CI 77510 (Ferric Ferrocyanide. (Turquoise): Cyclopentasiloxane, Trimethylsiloxysilicate, Mica (Ci 77019), Polyethylene, Lauroyl Lysine, Ozokerite, Octyldodecanol, Synthetic Beeswax, Lecithin, Tocopherol, Ascorbyl Palmitate, Citric Acid. May Contain (+/-): Ci 77891 (Titanium Dioxide), Ci 19140 (Yellow 5 Lake), Ci 77510 (Ferric Ammonium Ferrocyanide), Ci 77499 (Iron Oxide), Ci 42090 (Blue 1 Lake). (Twilight): CYCLOPENTASILOXANE, TRIMETHYLSILOXYSILICATE, MICA, POLYETHYLENE, LAUROYL LYSINE, OZOKERITE, OCTYLDODECANOL, SYNTHETIC BEESWAX, LECITHIN, TOCOPHEROL, ASCORBYL PALMITATE, CITRIC ACID. MAY CONTAIN/PEUT CONTENIR/ (+/-): CI 77163 (BISMUTH OXYCHLORIDE), CI 77491, CI 77492, CI 77499 (IRON OXIDES), CI 77891 (TITANIUM DIOXIDE). (Tuxedo): CYCLOPENTASILOXANE, TRIMETHYLSILOXYSILICATE, MICA, POLYETHYLENE, LAUROYL LYSINE, OZOKERITE, OCTYLDODECANOL, SYNTHETIC BEESWAX, LECITHIN, TOCOPHEROL, ASCORBYL PALMITATE, CITRIC ACID. MAY CONTAIN/PEUT CONTENIR/(+/-): CI 77499 (IRON OXIDES), CI 77891 (TITANIUM DIOXIDE). Get ultra-luxe, ultra metallic eyes using Laura's bestselling eye products and most coveted techniques. Step 1: Create a strong tightline with Tightline Cake Eye Liner in Black Ebony. Step 2: Prime the eye with Eye Basics in Linen. Step 3: Smoke out the inner and outer corners with Caviar Stick Eye Colour in Plum. Step 4: Add a metallic pop with Caviar Stick Eye Colour in Intense Moonlight. Step 5: Build a luxe metallic finish with Caviar Chrome Veil in Crystal Rose.